Our CBD products are 100% legal to buy and sell and do not require a marijuana or tobacco license. We provide our retail clients with the tools they need to succeed. Our CBD informational brochures make it easy to educate your customers and answer their questions. Businesses can attract attention with high-quality and eye-catching vinyl posters that can be placed inside or outdoors. All promotional resources are, upon request, with your business account. 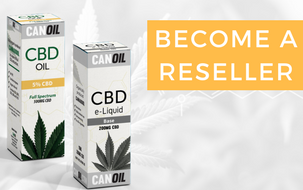 If you would like more information about purchasing CBD products for sale in your business?